As a homeowner, increasing the value of your home should be a point of emphasis, especially if you believe resale is a possibility. In most cases, increasing the value of your home can be done by making strategic renovations and upgrades. The same is true for your kitchen. The kitchen is one of the most important rooms in the eyes of potential home buyers. Here are a few upgrades you can make in your kitchen to increase the value of your home. One of the easiest ways to upgrade your kitchen is with a new paint job. It's a great way to add a personal touch to your kitchen while increasing the visual appeal for future buyers. It is recommended that the colors of your kitchen complement the rest of your home. Take note of the style and colors of the rest of your home and select a paint color (or multiple paint colors) to follow suit. If your countertops are outdated or in disrepair, consider replacing them as part of your next kitchen renovation project. Given the amount of use they receive, new (or relatively new) countertops could be a powerful selling point. During this process, install countertops that match your home's design, are low maintenance, and can withstand daily use from your family and guests. To accomplish all three of these, consider adding a butcher block countertop to your kitchen, as they are both stylish and durable. Another part of your kitchen that receives heavy daily use if its flooring. Over time, the floor will inevitably show signs of wear and tear. If your kitchen could use some new flooring, consider hardwood and tile options. 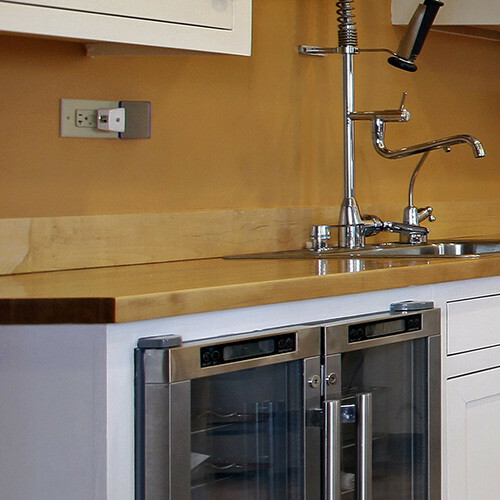 These are durable options that are adaptable to your kitchen's design (and your personal preferences). To add some extra value and protection to your kitchen, install a backsplash. Not only does a backsplash make your kitchen livelier, but it also adds a barrier to your kitchen's walls against water damage. Not only is proper lighting essential for safe use of your kitchen, but it can also help bring out the best features of this space. If you have recently renovated part (or all) of your kitchen, consider adding or replacing light fixtures to bring out these new, modern features. Whether it is your refrigerator, sink, dishwasher, or oven, adding new appliances to your kitchen will always be an easy value-add. If your appliances are old or outdated, this is especially true. No buyer wants to move into their new home and immediately need to make repairs or call a handyman. If you notice the piping under your kitchen sink to be old or rusty, take the time to replace it. Doing so will bring ease-of-mind to future buyers while also ensuring the long-term condition of your kitchen. If you are interested in upgrading your kitchen, consider adding a quality wooden countertop from Hardwood Lumber Company. With Edge Grain and End Grain options available, your new countertop will help increase the value of your home as well as appeal to future home buyers.